I've always been a Dakota Fanning fan and from before her days in Twilight. So when I was asked to review the movie, The Motel Life starring her, I didn't even care to read the synopsis. I just knew it would be something I would enjoy. 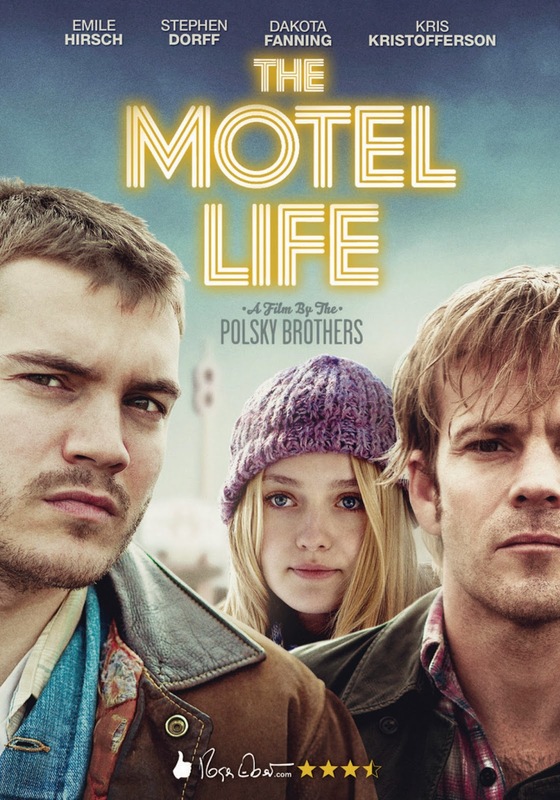 The Motel Life stars even more of today's popular actors including Stephen Dorff and Emile Hirsch. This film was released by Cinedigm on Blu-ray and DVD June 3, 2014. The synopsis says "This award-winning film is a searing and profound examination of brotherhood set in the timeless Sierra Nevadan frontier. Frank (Emile Hirsch, Into the Wild) and Jerry Lee (Stephen Dorff, Somewhere) are brothers who get by on telling fantastic stories and creating rich illustrations. When Jerry Lee is involved in a hit-and-run accident, the brothers are forced across the state to the home of Frank’s old flame, Annie (Dakota Fanning, The Twilight Saga). While they seem safe from the law, Jerry Lee’s instability and all-consuming guilt render their future increasingly uncertain. “Through a miracle of tone, mood, and emotion, The Motel Life adds up to a heartbreaking whole.”"
I would definitely have to say this is not a movie for the younger eyes. I actually liked it quite a bit and am surprised I hadn't heard more publicity behind it. With some great actors and actress this was a drama must see! I was a bit confused at a few points about Stephen Dorff's character but in the end, my questions were cleared up and answered. Recommendation: I think this was worth the purchase even though I am surprised to see it on the higher side for a movie I hadn't heard of before. I loved story and real life dramatics throughout the film and how the brothers react to the situations they are put in.